As a way to provide additional support to the people of Puerto Rico coping with the devastating aftermath of Hurricane Maria, the American Red Cross in Greater New York has been stationed at JFK’s JetBlue Terminal 5 since October 11, 2017 helping families and individuals arriving from the island. This assistance has come in the form of health and mental-health support; distribution of “comfort kits” (which include toiletries and other basic hygiene items), and additional information and referrals regarding City and community resources available to Puerto Ricans arriving in NYC. In their first week providing these services, the Red Cross met with more than 1200 individuals. 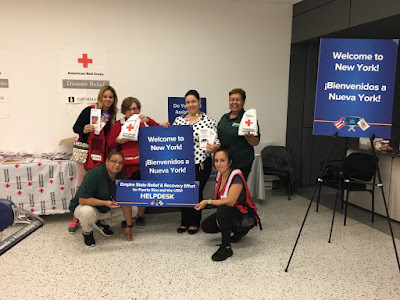 The Red Cross will be available at JetBlue Terminal 5 through October 18, after which their assistance will shift to a service center (run by New York City) at 1680 Lexington Ave. The goal of the service center is to further provide support and resources for recent arrivals to NYC affected by Hurricanes Harvey, Irma and of course Maria. For more information about the service center, including how to sign up for an appointment, click here. For more information about the American Red Cross response to Hurricane Maria, click here.